In 2013, the world woke up to the fastest running shoe – the adidas Ultra BOOST. So how did a performance shoe become the star of hip-hop, pop culture and athleisure? Initially designed for running, the adidas UltraBOOST was made to withstand high-impact, accelerate speed and redefine running techniques. However, a new wave of urban runners were looking for a shoe that would complement their running needs and accentuate their style. The shoe was backed by tremendous running technologies and innovation but it needed that slight edge that would throw runners into a frenzy. The adidas Ultra BOOST made its first appearance on the red carpet of the Billboard Music Awards and from there it became the “next big thing”. The shoe became an instant hit – everyone wanted a pair. Right from the OG silhouette to the new Primeknit sock, the Ultra BOOST is constantly revamping its style, technologies and colourways to fit the needs of the urban audience. 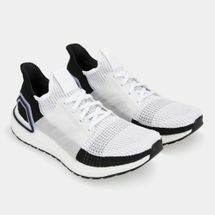 Whether you’re a die-hard sneaker fan or simply want a piece of the adidas Ultra BOOST action, then make your way to the Sun & Sand Sports online store and get ladies’ shoes or mens’ shoes delivered right to your doorstep in Riyadh, Jeddah and Saudi Arabia.